Romance, beauty and art. Three words that nowadays, sadly, will not be often associated with the fashion industry. Unless you are lucky enough to get a viewing of designer Luke Azzopardi’s works, that is. In that case, the three words are pretty much the embodiment of every piece he creates, maybe because he himself is the embodiment of those very ideas. Azzopardi’s is one of the more respected names on the local fashion circuit. His no-compromise attitude to fashion design – find what you love and bring it to life – finds its roots in his academic background in fine art and has resulted in a number of gorgeous collections, each drawing from the sphere of the arts for inspiration, each collection further blurring the lines between ‘art’ and ‘design’. Now, finally, Azzopardi has unveiled his 2018 couture collection, On the Museum’s Ruins, a whimsical, if dark, journey into a lover’s psyche. The collection includes 28 highly ornate couture looks, most of which incorporate artisinal hand-finishing techniques that required very painstaking handiwork. “This is what makes couture special, showing off technical skill for the pure sake of it. Maybe this is a symptom of the living ‘baroqueness’ of the country I was brought up in – There is that sense of ‘look at what I can do and how dramatic I make it look’ everywhere,” Luke says. Some of the outfits showcased are nothing if not larger-than-life, involving metres of Camilleri Paris Mode fabric, some from the label’s archives of rare and beautiful pieces. The result is gothic romance of the highest order, translated into opulent fabrics and flowing gowns set against the background of a hypnotic narrative. Because, you guessed it, once again it is the arts that have inspired the mood of the collection, more specifically John Keats’s celebrated poem Isabella and the Pot of Basil, a work that focuses on the tormented and the nostalgic. “Ultimately, I view the collection as an investigation of beauty, within the studio’s method of transposition between established literatures and contemporary fashions. Each piece revisits the sentiment of longing, where to long for something is reason enough to live,” Luke says. “The project is also a personal catharsis for me, with an eroticised narrative.” The venue that was chosen to show off the collection to the world for the first time is just as significant – the Grand Salon at the Museum of Archeology, in Valletta. In fact, Luke confides that the outfits themselves in a sense are a reworking of the Early Medieval style wall painting and decoration of the location, which is currently undergoing conservation and restoration, making the very concept of the show even more poignant and the chosen name even more meaningful. Reflecting this, Luke tells me that this collection was presented not as one of garments, but of artefacts undergoing ‘maintenance’ – during the show itself, art restorers continue working on the painting even while the models sashay down the ‘catwalk’. In this way, the designer wanted to present a commentary about the actual creation of the outfits, their journey and process – a departure from the end result typically favoured within the fashion industry, which often disregards all processes. “Bearing all this in mind, the Museum of Archaeology was the perfect venue. The moment of incompleteness in conservation is viewed as a moment of life in the otherwise frozen-like state museum objects find themselves in. It was a great opportunity to experiment with these concepts of ‘newness’ in a venue overridden with historical baggage. Of course, working with the support of professionals at Heritage Malta and the Museum of Archeology made all the difference. I turn the conversation back to the idea of powerful gothic romance that also gave birth to the collection. How does Luke manage to bring this narrative to the contemporary? He adds how, a lot of the looks presented, featured in some way or another the late Victorian corset, often brought to the outside and used as a sort of architectural cage, or boning. It brings images of gothic revivalism to mind but, the designer notes that it’s the ‘reworking’ of it that makes it relevant. Laser-printing, developed from the wall-painting itself, was also one of the methods of transposition and revisitation that were developed for this collection. “Together with designer Philip Sultana, I worked on this to try bring back that same element that made the studio’s work so memorable five years ago, with the first collection – highly ornate printing. Working with such a complex and sensitive venue as the Grand Salon was, naturally, not without its challenges. Luke brought on board project manager Becky Micallef and set designer Andrew Borg Wirth – together, the team worked for days on end. Yet, somehow, last minute niggles always seemed to crop up. “We had specific time slots we needed to adhere to, both with the venue and with respect to transportation in and out of Valletta.” The cherry on the cake was having the show coincide with the Valletta F.C.’s celebrations – the football team had just won the league and was holding the infamous ‘Funeral’ on that same night, hosting thousands of fans for a night of partying. Sporting such memories myself, I have to agree. Remembering the exquisite detail in some of the fabrics used by Luke, I turn the conversation back to the topic, wanting to know more about the fabrics. “I chose the fabrics I needed to be working with thematically, and I let them dictate what to become. After the show ended, soprano Miriam Gauci, a goddess in her own right, came out exclaiming “i tessuti!”, or something along those lines. "It was at that moment I understood that my love and respect for fabrics was visible; during my time studying at Central Saint Martins in London, and working closely with Victor at CamilleriParisMode, I learned how to listen to what fabrics have to say. And, after getting a glimpse into that world, I’m unfortunately a bit too accustomed to luxury now,” Luke says half-ruefully. 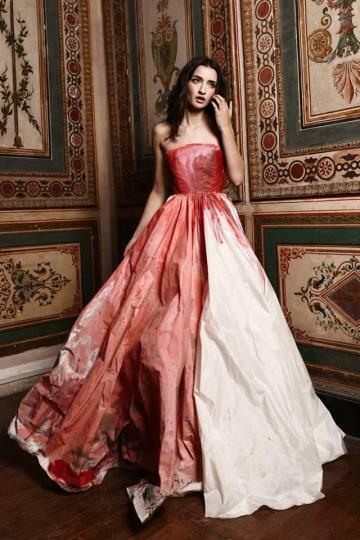 He mentions one favourite from the collection, an embroidered tulle ballgown that Anna Grech (ModelsM) wore. “The gown that Jacqui Losco (Supernova Models) wore was also particularly note worthy. Everyone called it the ‘half-half dress’ which is an adequate name seeing that between us we dubbed it the ‘Frankenstein Gown’. I guess it felt a lot like different gowns stitched together to form a new life, much like Dr Frankenstein’s monster. And a little nod to the coolest proto-feminist of all time, Mary Shelley, never hurt anyone,” the designer tells me. And on that cheeky note, we end the interview and I make my way back home, to dream some more about the luscious fabrics and gowns I have just seen, glad that some people are making the world a more beautiful place. This interview first appeared on the Sunday Circle Magazine. All photography is by Kris Micallef, shot on location at the Grand Salon of the National Museum of Archeology. Make Up: Gabrielle Zammit Grugo Hair: Hair & Co Studios Models: Amy Zahra and Gabriella Mifsud at Supernova Models.